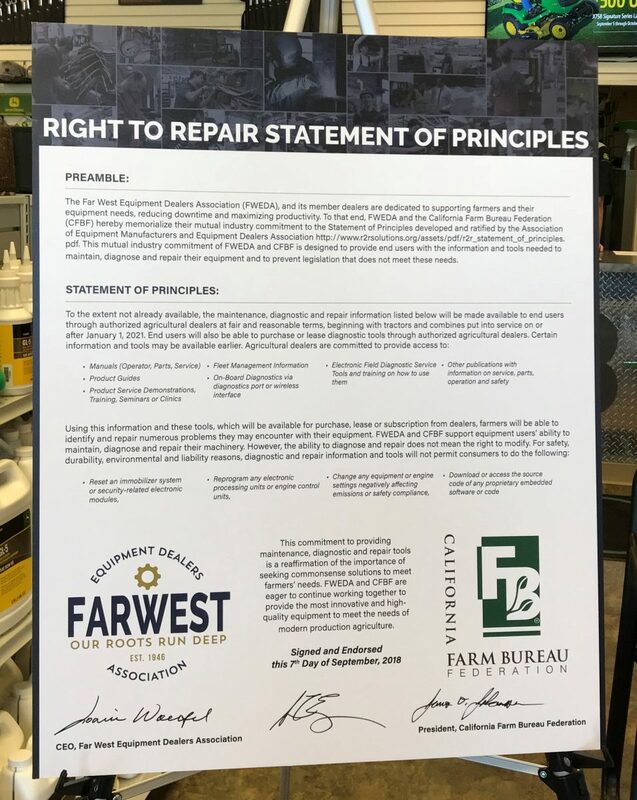 The California Farm Bureau has agreed to a toothless version of "right to repair" that was written by tractor manufacturers. Farmers have been some of the strongest allies in the ongoing battle to make it easier for everyone to fix their electronics. This week, though, a powerful organization that’s supposed to lobby on behalf of farmers in California has sold them out by reaching a watered-down agreement that will allow companies like John Deere to further cement their repair monopolies. Farmers around the country have been hacking their way past the software locks that John Deere and other manufacturers put on tractors and other farm equipment, and the Farm Bureau lobbying organization has thus far been one of the most powerful to put its weight behind right to repair legislation, which would require manufacturers to sell repair parts, make diagnostic tools and repair information available to the public, and would require manufacturers to provide a way to get around proprietary software locks that are designed to prevent repair. In most states, the legislation would cover all electronics, which includes tractors, cell phones, computers, video game consoles, appliances, and everything in between. So far, this legislation has been proposed in 19 states, but hasn’t yet passed. In any case, the momentum and outrage behind the right to repair movement is real, and the Equipment Dealers Association (which represents John Deere and other manufacturers) has been anxious to show that manufacturers like Deere aren’t actively trying to screw over farmers, while continuing to do just that. In February, the Equipment Dealers Association promised to make a few concessions—notably, the group said Deere and others would begin to make repair manuals, product guides, diagnostic service tools, and on-board diagnostics available to farmers by 2021. Notably, it did not promise to actually sell repair parts, and it also contains several carve-outs that allow tractor manufacturers to continue using software locks that could prevent repair. It is beyond comprehension, then, why the California Farm Bureau—which should nominally have the interests of farmers in mind—reached an agreement with the Equipment Dealers Association last week that enshrines the concessions the Equipment Dealers Association already agreed to, without seemingly getting anything else out of it, and without even getting it to move up its 2021 timeline. “This agreement is especially important because whenever we can resolve issues that concern us without passing laws, everybody wins,” Joani Woelfel, the CEO of the Far West Equipment Dealers Association, said in a statement. A side-by-side analysis of the promises made in the document the Equipment Dealers association put out in February and the agreement signed last week are identical. The "Statement of Principles" (below) are also identical to a PDF the Equipment Dealers Association put out in February. If anything, it is more restrictive, because it enshrines what the Farm Bureau of California now believes farmers are not supposed to do with their tractors, which includes modifying the embedded software. An information sheet put out by the Equipment Dealers Association in February. The "Statement of Principles" from last week's agreement. And that’s exactly the point: There will likely no longer be a right to repair push for farmers in California. What this means, then, is that the most powerful lobby fighting for right to repair sold out its constituency for no discernible reason, by agreeing to a manufacturer-centric version of right to repair that gives farmers literally nothing that they weren’t already going to get. In doing so, it’s difficult to imagine the California Farm Bureau continuing to fight for right to repair legislation in that state. "When it is up to the manufacturer to decide what information to share and what to withhold, you haven't addressed the problem," Gay Gordon-Byrne, Executive Director of the Repair Association, which is leading the right to repair movement, told Motherboard in an email. "We're also concerned that the agreement fails to mention anything about fair and reasonable pricing for parts, nor any mention of how farmers will get firmware, updates or patches." This is a bad deal for farmers, who are now almost certainly screwed in California. Without the Farm Bureau’s support, agricultural equipment may be written out of any future right to repair legislation. It’s also not good news for anyone else, because the loss of a powerful right to repair lobby could have trickle-down effects that harm the whole effort. California, it should be noted, is a particularly important state considering it’s the home base of Apple and many other electronics companies. "This agreement does not end monopolization of farm equipment repair,” Nathan Proctor, who is heading consumer rights group US PIRG’s right to repair efforts, told me in an email. “While it highlights how industry is feeling the pressure from Right to Repair, it also underscores that we need to do more if truly want the freedom to fix our property."